A file photo of RBI governor Duvvuri Subbarao. 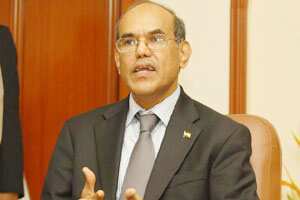 Vijayawada: The Indian economy is poised to miss the central bank’s growth forecast for the current fiscal year, while the inflation outlook is uncertain, Reserve Bank of India governor Duvvuri Subbarao said on Thursday. “Today (the) macroeconomic situation is a cause of concern, cause of pain, because growth is falling, inflation is stubborn and rupee is weakening," Subbarao said at an event in the Andhra Pradesh. He was making his first extensive remarks since the RBI on Friday left interest rates on hold after 13 increases since March 2010 and shifted its focus towards growth as the once-surging economy is battered on several fronts, even though headline inflation remained above 9% in November. Food inflation, a key driver of broader price pressure, has fallen dramatically in recent weeks even as manufacturing and fuel price inflation remain elevated. Data on Thursday showed annual food inflation fell to 1.81% in the year to 10 December, from the previous week’s 4.35%. The recent tumble in the rupee has complicated the RBI’s inflation-fighting by making imports of fuel and other items more expensive, and Subbarao’s remark on Thursday about the inflation target rattled markets. The benchmark 10-year bond yield rose 3 basis points to 8.37% after his comments. “It is worrying. I think the governor was absolutely right in pointing out the uncertainty that has crept into the environment. There is a likelihood that the (inflation) situation does not improve too much," said Saugata Bhattacharya, an economist at Axis Bank in Mumbai. He said an improving US economic outlook and a less-dramatic-than-feared slowdown in China could keep commodity prices near current levels. “The combination of the two definitely has increased the risk to what we had initially thought about inflation," he said, adding that he nonetheless expects inflation to drop below 7% by the end of March. Analysts have been cutting growth forecasts for India. Some expect the economy to struggle to grow 7% in the fiscal year ending in March, below last year’s 8.5%. BNP Paribas expects the India to grow just 6.5% in the current fiscal year and 7.1% in the following year. In late October, the RBI cut is growth forecast for the current fiscal year from 8% to 7.6%. It will revise the figure on 24 January. “By all expectations that number will be lower than 7.6%," Subbarao said on Thursday. The rupee was down last week nearly 20% from a July peak to a record low before recovering somewhat after the RBI’s administrative measures to prop it up and, according to traders, intervention in the forex market. The RBI’s policy is to intervene in the market only to ease volatility. “Rupee has appreciated slightly in the last one week, perhaps because of better appreciation of our economic situation and also in response to the policies of RBI," Subbarao said. Subbarao reiterated on Thursday that the rupee level should be determined by the market and that the RBI will act to contain sharp volatility in the rupee. “Our administrative measures will curb undue speculation and ensure that interest of the genuine customers in forex markets are not affected," he said. “And of course exchange rate will improve as soon as there is better news from Europe," he added. India’s economy grew 6.9% in the September quarter, the slowest in over two years. Data last week showed the October index of industrial output fell 5.1%, far worse than expected, with annual capital goods output plunging 25.5%, a sign of dismal corporate sentiment. The darkening outlook for the Indian economy has prompted speculation that the RBI, which had been a global outlier by continuing to fight inflation even as central banks elsewhere looked to bolster growth, might accelerate a shift to looser monetary policy in early 2012. Policy gridlock in New Delhi following a spate of corruption scandals has battered investor sentiment and stalled approvals of major projects needed to ease capacity bottlenecks that curb economic growth and add to inflation. Earlier this month, the government slashed its full-year growth forecast to between 7.25% and 7.75%, down sharply from an estimate of 9% issued in February.